Could the best be yet to come for the Reds’ perennial POTY? With great power comes great responsibility, and if anybody can relate to that sentence it is David de Gea. This summer saw him go from hero to zero after Spain suffered a disastrous World Cup campaign. Being unable to prevent goals from Russia and Morocco was a shock to say the least, as his questionable performances meant that he became the poster boy for the Spanish media’s hate campaign on their national team. His status as one of, if not the, best goalkeeper on the planet was called into question by the world’s media as some fans began to wonder, is this the end of DDG? Personally, I think that the best is yet to come from the goalkeeper. Judgement and negative opinion regarding his ability is nothing new for de Gea, and I am certain that the questions over what he is capable of will only spur him on to achieve greater things, like it did back in 2011 at Old Trafford. De Gea’s life in a United shirt did not start easily. At 20-years-old the Spaniard suffered extreme criticism as people questioned why Fergie had broke the bank with a British record fee for a goalkeeper who looked nervous and quite frankly out of his depth. From failing to save Shane Long’s goal in United’s 2-1 victory over West Brom in 2011, to that 6-1 loss I’m sure we would all rather forget, many applauded the decision to replace the Spaniard with Anders Lindegaard. For many young goalkeepers that experience would be make or break. Luckily, it made de Gea into the player we see before us every weekend, saving his teammate’s bacon with impressive saves and a composed exterior. Even at 20-years-old the goalkeeper had fierce self-belief and a very strong character, something which has carried him through the ebbs in his career, which is why I have no doubt that he will bounce back and prove his worth. Despite starting out with a very slender, weak frame that he has since been able to build on, de Gea has built demonstrated great agility and reflexes with his acrobatic dives. The goalkeeper also seems settled in Manchester, and with every knock on the door from Real Madrid, he never seems to answer their calls, or faxes for that matter, and the move never ends up coming into fruition for Los Blancos. De Gea faced harsh criticism from the press when Spain crashed out of the World Cup. However, if de Gea’s head was to ever be turned, waiting in the wings is another competent goalkeeper who is used to fighting for the number one spot: Sergio Romero. A skilled goalkeeper within his own right, the Argentinian has experience at numerous clubs and also for his country, including a World Cup final and possesses talent that makes up for some of de Gea’s shortfalls that still need improvement. Just last year the Spaniard’s distribution was the least accurate of all goalkeepers from the top six clubs. 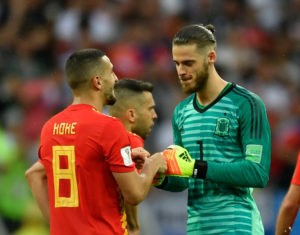 His inability to create a commanding presence has also been discussed, with calls for de Gea to play a little more out of his goal and demand more from his defenders, something which Romero does with ease. This is not saying that Jose Mourinho should cast de Gea to the side and make way for Romero, but that whilst the goalkeeper may be considered as one of the world’s greatest, there is always room for improvement. The Spaniard will hopefully have many more years at Old Trafford, and has certainly demonstrated that he can take constructive criticism. At such a young age, the fact that he has won so many personal accolades at the club makes me believe that he could easily emulate the likes of Edwin van der Sar and Peter Schmeichel. Van der Sar was 34-years-old when he arrived in Manchester and still made a huge impact on the club during his six years of service and there is no reason why de Gea could not mirror the Dutchman’s achievements, and beyond that. His improvements in the last seven years have been outstanding, going from somebody that some United fans struggled to watch due to frustration and nerves, to one of the most reliable and well-respected members of the squad. Whilst he may still be recovering from his nightmare in Russia, don’t be surprised if the Spaniard dusts himself off and prove to the world why he is such a vital piece of United’s puzzle.